DESTROYER666 should need no introduction. But back in 1997, the Australians were a relatively new entity, forming from the ashes of Bestial Warlust and introducing themselves to the metal underground with the Violence is the Prince of This World EP in '95. 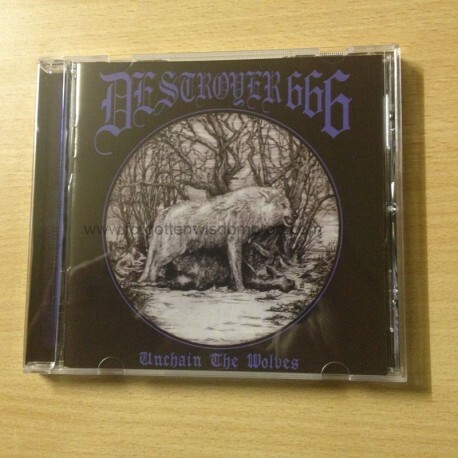 Two years later, DESTROYER666 would throw down the gauntlet to the international metal scene with soon-to-be-classic debut album Unchain the Wolves. Devastating yet dynamic to the bitter, bloody end, Unchain the Wolves comprises 50 minutes of black metal magick 'n' might that quickly became the band's ever-unique trademark: epic and anthemic songwriting, gritty yet considered execution, and each song as integral as the last. Just try not headbanging to stone-cold classics like "Australian and Anti-Christ" and "Satan's Hammer"; if you don't, then you must be dead. Now, HELLS HEADBANGERS unchains the wolves with vinyl LP, CD and pro cassette versions of this heavy metal classic. As DESTROYER666 themselves said, Unchain the Wolves!